Posted 29th January 2017 & filed under Blog, Intergenerational Justice, Pensions. Young workers in both Britain and America will need to save a much bigger proportion of their salaries during their working lives if they want to achieve the same level of income in retirement that today’s retirees enjoy, according to new analyses from both the BBC and the Washington Post. How much do they need to save? In order to illustrate the scale of the savings challenge facing young adults, the BBC commissioned the actuaries Hymans Robertson LLP to undertake some modelling of what level of savings will be necessary to afford a given level of pension in the future. Specifically, they were asked to work out how much a typical young worker today would need to save to be able to afford a private pension worth £12,000 per year if they want to retire at age 68, which is currently scheduled to be the state pension age for men and women of their generation (although this may rise following the Cridland Review of the state pension age). They chose this target because the average retired household currently spends £21,770 per year, so they made a broad assumption that people will need an income of at least £20,000 when they retire, £8,000 of which will come from the state pension (although this assumes that all of them will qualify for the full amount under the “new” state pension, when in reality many will not). This analysis also assumed that savers would be looking to build up a fund which they would then use to purchase an annuity (specifically, an inflation-protected lifetime annuity that offers 50% survivors’ benefits). Of course, under the pension freedoms which were introduced by the previous government people no longer have to do this when they want to begin drawing down their pensions, but it remains the most widely-chosen method of providing a retirement income. What the BBC found was that someone who is in their 20s and earning the median national salary of £26,364 would need to save £246 per month in order to achieve this target, or almost 15% of their monthly salary. Someone who puts off saving until they reach their mid-30s would need to save even more: £404 per month, or over 20% of income, assuming they were still earning the national average salary. These levels of saving look very challenging indeed for young workers who are likely to be living in the private rented sector and/or saving up to get on the housing ladder. There are two main reasons for why young people need to start saving so much: the decline of defined-benefit pensions in the private sector, and the climate of low investment returns. This second point was particularly emphasised by the Washington Post, which used data from the Employee Benefit Research Institute (EBRI) to argue that today’s young people need to save more money than their parents would have done to achieve the same level of savings because average investment returns are likely to be several per cent lower over the long term than they were in the past. The newspaper found that stock market returns in America have averaged 8.6% over the past 100 years, but economic forecasts now suggest that over the foreseeable future they might only average 6.6% per year. This may sound like a small difference, but the impact of compounding means that would become hugely significant over time. If returns maintained their historical average, then an investor who starts saving in their 20s could get away with only contributing 6.4% of their salary into a pension and still have an “adequate” income in retirement (as defined by EBRI); but a 2% fall in investment returns would mean they would have to contribute at least 14.4% per year, which is over twice as much (and roughly the same level as the typical young worker in Britain now needs to according to the BBC). Governments do a lot to try to encourage people to save through providing tax relief and other incentive schemes, but if young people fundamentally lack either sufficient funds to make any real savings, or returns are going to be permanently depressed, then it raises the question of how effectively private pension schemes can provide an income in retirement for the current generation of young workers. 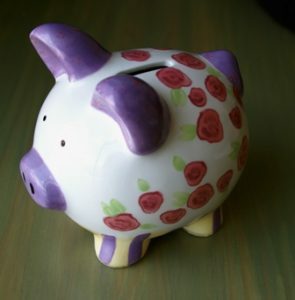 Image: Ceramic piggy bank, reproduced under the conditions of Wikimedia Commons, CC BY-SA 3.0, File: Piggy bank2.jpg.